Wilen Masonry was founded by Dion Wilen in 1992. Dion learned the masonry trade in the Minneapolis, MN area. Over the years the company has grown steadily with a focus on custom residential and light commercial work. In the early years custom fireplaces and brickwork were the largest portion of our sales. While custom masonry fireplaces have remained a focal point of our business, over time we have seen a significant change from brick to stone as the more prominent cladding choice, in our area. In 1998, Wilen Masonry became certified installers of Senergy EIFS (Exterior Insulation Finish System). In 2003, the company discontinued applying EIFS because of concerns about insurability and providing a long term, trouble free product for our clients. In 2004, after satisfying our concerns, we again added EIFS to our services, with a commitment to proper installation. Wilen Masonry, Inc. is currently certified to install both Dryvit and Senergy brand of EIFS, two industry leaders. We carry a stock of Indiana Limestone of various sizes and in the gray & buff colors. 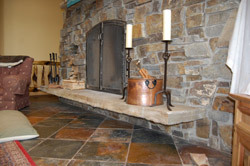 We currently have dealerships with Boulder Creek Stone and St. Croix Stone. One of our basic principles is to have a safe and pleasant work place. We hope to continue growing and look forward to a safe, profitable future. Wilen Masonry, Inc. is trusted all over the region to provide quality masonry work including fireplaces, EIFS, stone, and brickwork.